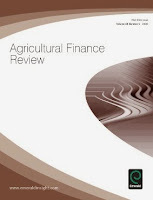 Agricultural Finance Review (AFR) was born from the United States Department of Agriculture (USDA), Bureau of Agricultural Economics in 1938 to review the latest developments and research in the field of agricultural and agribusiness Finance. AFR began being published by Emerald in 2009, transitioning from the Department of Applied Economics and Management at Cornell University in a new phase of the journals development. Since its formation 75 years ago, AFR has become the primary field journal in the world. Editor Calum Turvey has produced a biography of this prolific journal's past for you to read.